(Nanowerk News) Scientists in China are reporting an advance that may improve the natural wonders of wool — already regarded as the “wonder fabric” for its lightness, softness, warmth even when wet, and other qualities. They say the discovery could give wool a “brain,” placing it among other “smart” fabrics that shake off wrinkles, shrinkage and “breathe” to release perspiration. The study is in ACS’ Langmuir ("Fabricating Superhydrophilic Wool Fabrics"). 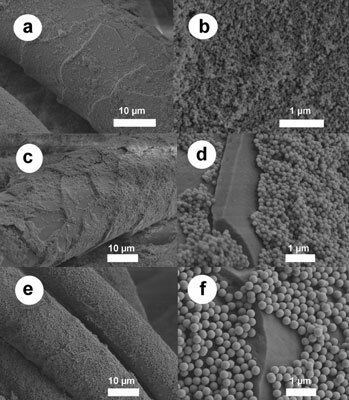 Images from an electron microscope show wool fibers coated with the silica nanoparticles that may improve wool’s qualities. Fangqiong Tang, Yi Li and colleagues note that wool is naturally water-repellant, or hydrophobic, a feature that acts as a barrier to enhanced features such as anti-wrinkle, anti-shrinkage finishing and dyeing. Wool’s water-repellency also hinders its ability to absorb moisture and makes wool garments feel sweaty. Although scientists have developed treatments that make wool more hydrophilic, or water-absorbing, they may not last long, may damage the fabric, and are not environmentally-friendly. The scientists describe development of new coating that appears to ease these problems. It is made from silica nanoparticles of 1/50,000th the width of a human hair. The particles absorb excess moisture, and make wool superhydrophilic. The new layer does not affect wool’s color or texture and can withstand dry cleaning, the scientists note.